Nokia has been here before, with the Symbian-based 808 PureView. Here in the US, we never really got that model, but it was available in Europe since mid-2012. That changes shortly, as the Nokia Lumia 1020 is a Windows Phone-based system that has an updated version of that 41mp camera, and was announced today. It will be available in the US. So let's go back a second and talk about the 808. The Zeiss-designed camera in the 808 had a number of unique features. First, it used a larger imaging sensor than most phones do. In normal operation, it produced 8mp images, and it did that by "binning" the larger sensor output. More interestingly, it had options for using the extra pixels sort of like a "4x digital zoom" lens, so the phone, while a bit bulkier than a standard phone, never had that "extending lens" thing happening when taking images. Moreover, there was a real Xenon gas flash, just like "real cameras." Most testers of the 808 lauded its image quality compared to other phones, and some even compared it to a compact camera. 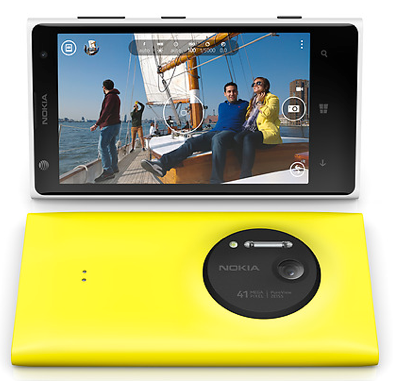 Today, the Zeiss PureView idea is back, this time in the Lumia 1020 smartphone. The 1020 is a 10.4mm thick phone (by way of comparison, the iPhone 5 is 7.6mm thick, a Sony RX100 is 36mm thick). A number of small enhancements have been made, including optical image stabilization, 1080P/30 video, and more. The lens is a 26mm equivalent f/2.2 made up of six elements, designed by Zeiss (technically, it's a Zeiss Tessar design). This time around the camera will use a 34 or 38mp sample (depends upon aspect ratio) of the image to create 5mp final images. As before, you can zoom in during playback and create "lossless" 5mp crops within the full resolution image if you desire. This applies to video, as well. Serious shooters still get the Nokia Pro Camera mode options to better control what the camera is doing, but there's also the Smart Camera mode for the more casual shooter, too. The one step backwards I see is that the phone now has a fixed 32GB of storage, and no removable microSD card slot like the predecessor. Price is US$300 at AT&T with sales starting in July. This is going to really up the necessity to move images you shoot off the camera into the cloud, I think. To rub salt in the camera makers' wounds, there's an accessory grip with a tripod socket ;~). Let's assume for the moment that the Lumia 1020 inherits at least as good of image quality as the old 808. That is to say, darned good for a phone. Probably state of the art for a phone, especially considering the Zeiss engineering and lens. The question us gear heads are pondering is what it means in terms of other pocketable camera options. Simple answer: Nokia is a first mover and a good one. The "serious camera in phone" options are about to start exploding, and this bodes poorly for the lower to mid end of the compact camera market. The potential options for selling compact cameras keep narrowing: bigger zoom ranges, larger sensors, raw file support, and…well, what else is there, really? Even those things are in danger, as larger sensors are slowly moving into the smartphone and there's no reason why a phone can't save raw image data. I'm reminded of when scanners and faxes got sucked into desktop printers: sometimes convergence happens and the sum of the parts is enhanced. That's what is happening with lower end cameras. Just as there are still high-end scanners, they'll likely always be high-end cameras, but the total market size for the camera makers is getting diminished daily now, because the converged device is getting more than competent at the basic needs. My proposed solution to this problem, one I saw coming quite some time ago, was that some of the makers would need to go "Intel Inside" to survive. This appears to be part of Zeiss' strategy, and their logo is nicely positioned on the new Lumia 1080 and I'm sure they're getting a revenue stream from Nokia for that. So one interesting game to play is "match the phone maker with a camera maker." Nokia — already a Zeiss Inside user. Apple — high propensity to put their own spin on things, but their original camera was a Kodak/Apple venture, so there's a possibility they might find a cooperative partner again. Still, doubtful in my mind. Apple won't want to enable others again, as they did with Samsung. Samsung — they make cameras, so they'll go it alone. Sony — they make cameras, so they'll go it alone, though they might continue to use external lens resources (e.g. Zeiss, Olympus). Motorola — they would need a camera partner. Given the Google ownership and the Nik/Nikon relationship (Nik was partly owned by Nikon, and is now owned by Google), there's a reasonable chance that they would go "Nikon Inside." This would probably be the best scenario possible for Nikon, as well. HTC — so far going it their own way. HP — most people don't realize this, but the old HP camera group had strong ties with Pentax. Unfortunately, the Ricoh takeover and the brand muddying isn't going to help that. "Ricoh Inside" doesn't have any meaningful marketing clout. HP needs to make a splash when it re-enters the phone market, but they don't have a partner with which to do that. Blackberry — they've got bigger problems to solve than just making better cameras in their phones. On the one hand, that's an opportunity for a camera company to come in and take on that role. On the other hand, they don't have the resources or time for any diversions. First things first, they need to make the Q10/Z10 stick in the market and start them back on a growth curve. LG — Korean company with a Japanese partner seems a little bit of a stretch. I'd expect them to look elsewhere for help should they decide they need it. Hmm, well that suggests that the camera makers still have a little breathing room, as the phone makers haven't really locked in their camera offerings nearly as well as they could. Some of that has to do with volume and very small sensor/lens developments. There are orders of magnitude differences in smartphone production versus compact camera production, and coupled with the "small" problem that put some crimps on early smartphone camera capabilities. That's really the news of late, including the Lumia 1020: they restraints are coming off as the need to find competitive advantages increases in the smartphone market. Things will heat up faster and faster now, despite my tongue in cheek assessment, above.